Trailers shown in these videos are used for example/demonstration only. The video above features our 18 cuft. XL model. See specifications in this ad for details regarding the actual trailer you will receive. With more than 4000 trailers on the road, LUMINA is our best-selling trailer for seven years running. Why? Maybe it's Lumina's bright shine. Perhaps it's the trailer's ample storage, or could it be its solid construction? Whatever it is, LUMINA's got it! Our base model LUMINA is a pull behind motorcycle cargo trailer designed with diamond tread plate and sleek black aluminum sides. This trailer boasts 14 spacious cubic feet of storage allowing two people to easily pack enough luggage for a full two-weeks of traveling. The trailer looks great behind your Harley, Goldwing, Can Am Spyder or any motorbike, trike or cycle. We constructed Lumina's chassis from aluminum and suspended it with a torsion axle to keep it light weight and smooth towing. Weighing in at only 170lb, this mini trailer is so feather light that you will almost forget that you're towing anything at all. Perhaps you've heard this rumor: steel chassis are preferred to aluminum ones because aluminum is vulnerable to stress fractures. Really? The chassis on GM's high performance Corvette Stingray is aluminum. How's that for stress management? Leaning into a turn is a necessary (and fun) part of riding a motorcycle. 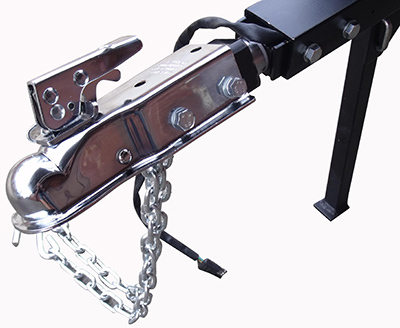 Sadly, when towing a trailer, traditional couplers do not allow the appreciable lean needed in a turn, which can cause flipping, binding, or jack-knifing. To help avoid these potentially deadly situations, industry insiders (Read Article Here) strongly advise the use of a swivel coupler, and we agree. Unfortunately, swivel couplers can cost$149 or more. We understand that price may be a concern, but trailering without one risks your well-being, the well-being of your passenger, and that of others on the road. We believe this so strongly that we are giving you a FREE swivel coupler with your purchase of a Lumina. It is our gift of peace of mind. Do not expect to find an offer like this if you buy a trailer elsewhere, DO expect to purchase a swivel coupler separately and DO expect to pay more. Why pay more for peace of mind, when you can get it for free at The USA Trailer Store. Trike and Can-Am Spyder owners, you can trade the swivel coupler for a FREE trailer cover! Chrome coupler - Designed for durability, the coupler is corrosion resistant & ideal for use in all environments. Designed with an Overlapping Lid - This feature keeps water from inside the trailer & ensures dry luggage during travel. *A free trailer cover may be substituted in place of the free swivel coupler. Got it home, put it together, wired the bike and away we went. From the northwest corner of Mississippi, the Tail of the Dragon, from the bottom to the top of the Blue Ridge Parkway, and finally the Outer Banks on the East Coast. Perfect!!! Leaving in April for a year ride. Trailer came delivered right to my garage. I was skeptical of the reviews that said easy to put together. I liked the way everything was packaged separately like an assembly line. From the time I opened the box until the last nut was tightened was 75 minutes! Quite impressed how easy it went together. I did this alone but I recommend having someone help you lift it out of the box. Not heavy really, just awkward. Lights worked 1st time I plugged the trailer up. Seems perfect for what I want it for. I've already recommended it to a number of friends. Oh, And the price was great! very good quality.....Extremely easy to put together....with a few ice cold beer's...it only takes about 45 minutes to assemble....all the pre-drilled holes matched up perfectly...looks awesome hooked up to our bike......great value compared to other trailers.........no one can go wrong with these trailers!!!!!!!!!!!!!!! Posted by David Rogers Sr. on Apr 30th 2016 Posted by David Rogers Sr. Took me about 1 1/2 hours to unpack and fully assemble my Lumina XL Motorcycle Trailer. Having the hardware packed in bags according to the different steps you are preforming is a nice touch, saves a lot of sorting. The instructions and illustrations are easy to follow. Looking forward to many miles of use. Thank You USA Trailer. I I bought the trailer for a upcoming road trip with me and the wife. I have made to small 100 mile trips and everything seems to be great so far . will update later after trip in June. The trailer worked great on our first trip out. Not a single problem. Well just me learning to back up with the trailer. other than that, I could almost forget the trailer was there. we put in about 1300 miles this first trip. On the second trip we put in 1641 miles on a 5 day trip. Trailer held plenty for us with room to spare. I highly recomend purchasing this trailer or the Lumina XL. Very nice trailer. Great value for the price! Delivery of the trailer was handled well as I was notified in advance of delivery. No damage to the container. R/L carriers did a good job as well as the transfer delivery company. I was able to assemble the trailer in about 2 hours and it was very easy. The instructions were very clear and precise. Trailer is very light and easy to handle. All I have to do now is convert my 4 pin square connector to the 4 pin flat and I'm ready to ride. Can't wait to get it on the road. And Thanks for the free cover. I will send pics later. Fast shipping. Quality is first rate. Easy instructions and goes together very easy. Haven't tried it out yet but looking forward to packing our camping gear and hitting the road.